At an auto show a few months back I got to talking with Pete “Hot Dog” Finlan, the former painter from West Coast Choppers, about custom painting a couple welding helmets for Arc-Zone. I envisioned a cool old school hot rod theme, with gold leaf, metal flake, and pinstriping. Pete, who also happens to be the uncle of Sarah, the Shipping Manager here at Arc-Zone, was up for the job. 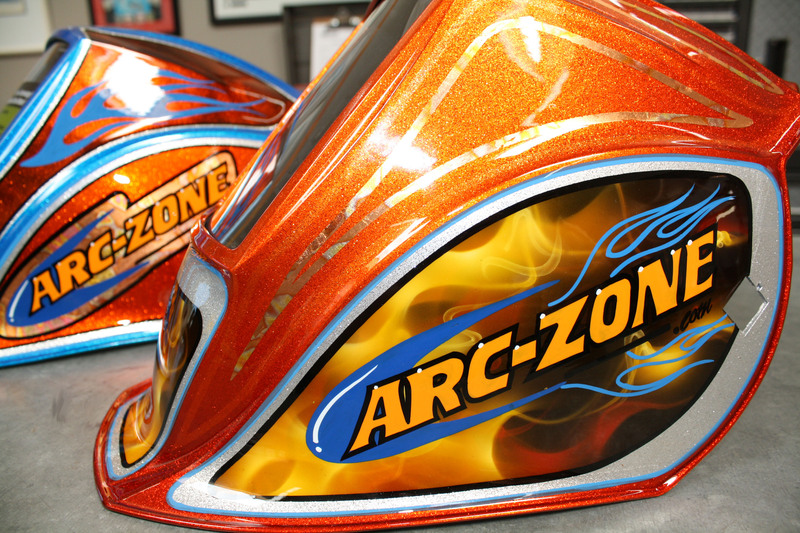 I gave Pete two Miller Digital Elite welding helmets with instructions to paint a personalized helmet for me and another helmet that we could give away to a lucky Arc-Zone customer. I chose the Miller helmet shells because of their cool shape, comfort, and lens technology. Yesterday, Pete dropped off the finished product, and everyone in the office was blown away by how great these helmet shells look. The level of detail in each of these helmets is mind boggling. 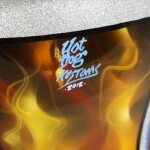 Hot Dog is a master at all the old school styles – flake, gold leaf, pinstriping, lettering, flames, airbrush. There are custom-look welding helmets for sale, but these are on another level. Pete, a.k.a. 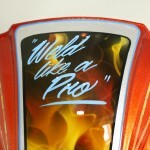 Hot Dog, has been creating world-class custom paint jobs since 1982. 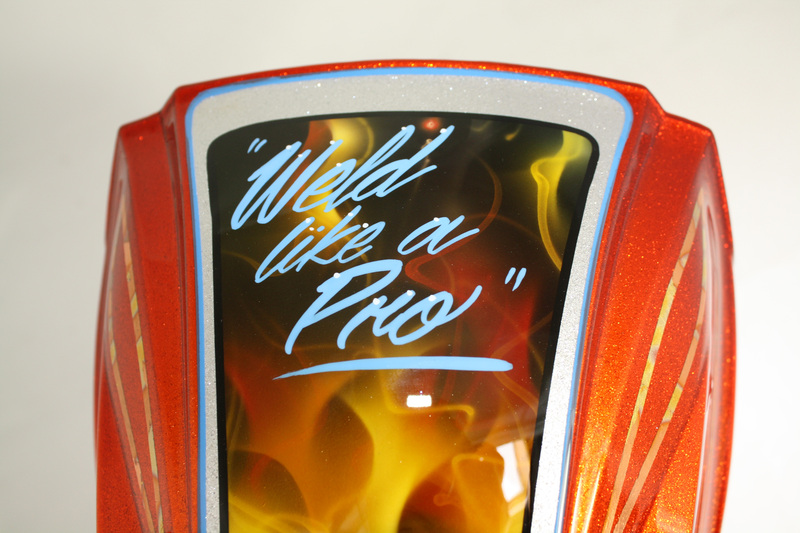 Pete began his career airbrushing surfboards and progressed rapidly to master all the various aspects of custom paint, including airbrush sign paint and pinstriping. For several years, Pete worked as the in-house painter for West Coast Choppers. Nowadays, Pete remains busy with various custom painting jobs through his company, Hot Dog Kustoms, and participates in painting competitions at auto and motorcycle shows nationwide. The darker orange and blue helmet will be the first custom-painted helmet shell I’ve ever had in all my years of welding. In the past, I have always decorated my helmet with stickers. I remember back in the day when my dad and I painted our own welding helmets because we wanted a custom look on a shoestring budget. Having a famous hot rod painter like Hot Dog paint a welding helmet for me was something I only dreamed about back then. It’s good to be Joe Welder! 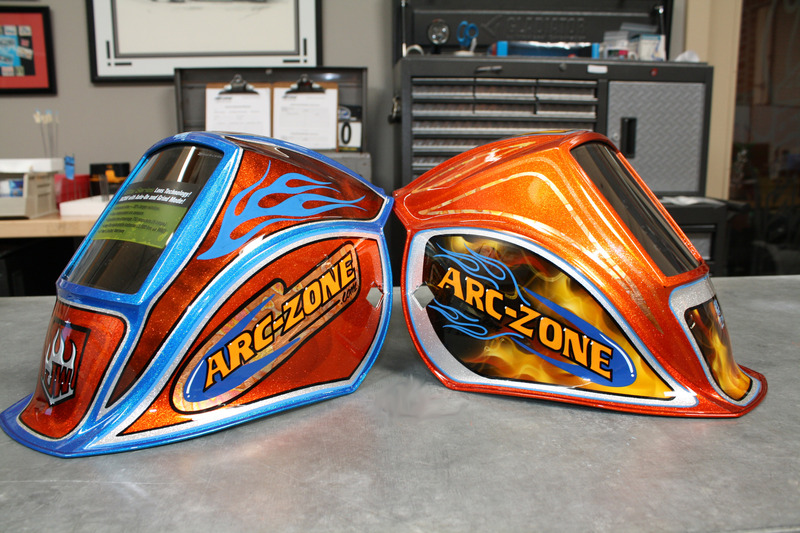 As I am sure you are all wondering, we have big plans for one lucky Arc-Zone customer to get their hands on the other Hot Dog Kustoms welding helmet, and we will be making that announcement soon. Stay tuned! The helmet is orange with yellow airbrushed flames on the sides, front, and top. 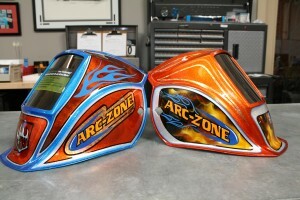 On each side is the Arc-Zone.com logo, and the top reads “Weld Like a Pro”. 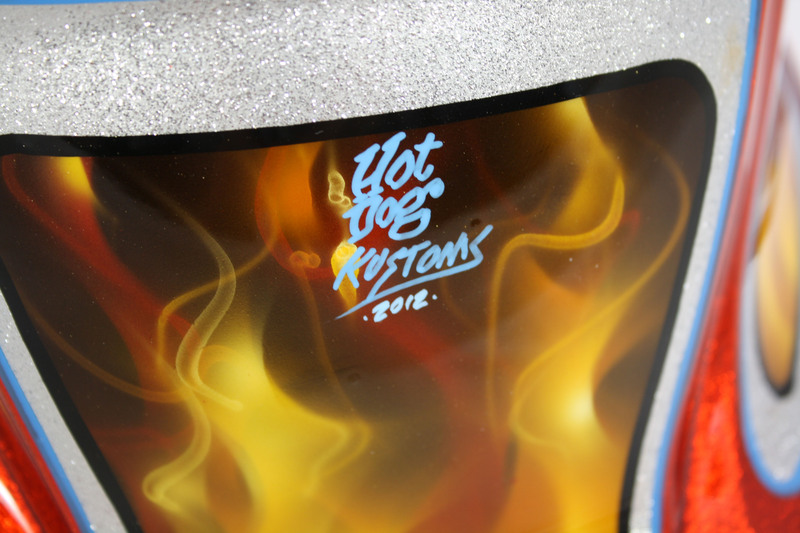 In the front, the helmet is signed by Hot Dog Kustoms and dated 2012. Wow those are some nice looking helmets. How do I sign up for the free one? Thanks Larry! We’re working on a fun way to give it away as we speak, and we’ll let you know how to get involved soon. Those flames look incredible! How do I get this? We’re figuring out a fun way to give it away as we speak. We’ll keep you posted when we know exactly how to give everyone a chance to win it. Glad you are updating the Joe Welder Blog again. Thank you again for the great service and products. I’m getting the hang of TIG welding slowly, and the cool kit is perfect. Just like you said, it comes with everything I would need to start welding. I WANT THAT HELMET!!! WOMAN WELDERS NEED COOL STUFF!! Glad you like the helmet Melissa! How much $$$ would a kustom painted monster energy shell run with the green monster M all over?